Plants can be set in spring. They should be spaced 2-4 inches apart in a 5 inch deep furrow. 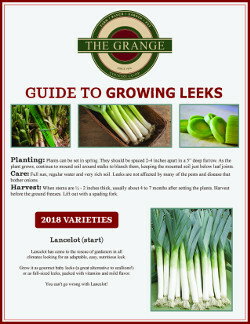 As the plant grows, continue to mound soil around stalks to blanch them, keeping the mounded soil just below leaf joints. Full sun, regular water and very rich soil. 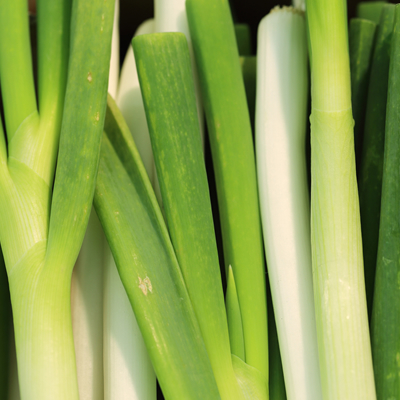 Leeks are not affected by many of the pests and diseases that bother onions. When stems are 1/2 – 2 inches thick, usually about 4 to 7 months after setting the plants. Harvest before the ground freezes. Lift out with a spading fork.